The arrest of the assassins of a Somali lawmaker has raised hopes that the new government in the Horn of Africa may manage to restore the law. Three men were arrested for shooting at a parliament member named Cammir Ahmed Tiiti Wednesday afternoon, police spokesman Colonel Abdullahi Hassan Barrise told a Press TV correspondent on Thursday. Col. Barrise added that the police were looking for a fourth suspect. 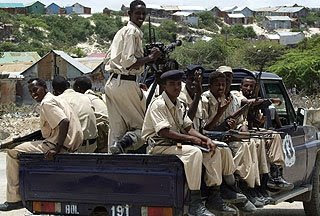 In the shooting incident in Mogadishu's Shiibis district, Tiiti's driver and one guard were killed. The Somali lawmaker himself sustained serious injuries for which he was transferred to a Ugandan military hospital at Aden Adde International Airport. According to Col. Barrise, the detainees -- who are infamous for involvement in armed robbery and murder -- have been confirmed as the real perpetrators of the crime. Somalia has long been the scene of relentless violence and conflict between rival factions such as al-Shabaab -- the military wing of the Union of Islamic Courts (UIC) -- and forces loyal to the former transitional federal government. Armed bandits raid homes and attack business centers while the pirate-infested waters of Somalia, where no foreign ship is safe, have become a cause for serious international concern. Elected by Somali lawmakers and backed by prominent religious leaders, President Sheikh Sharif Sheikh Ahmed is now tasked with bringing Somali rival parties together and weeding out insurgency in the troubled African country.